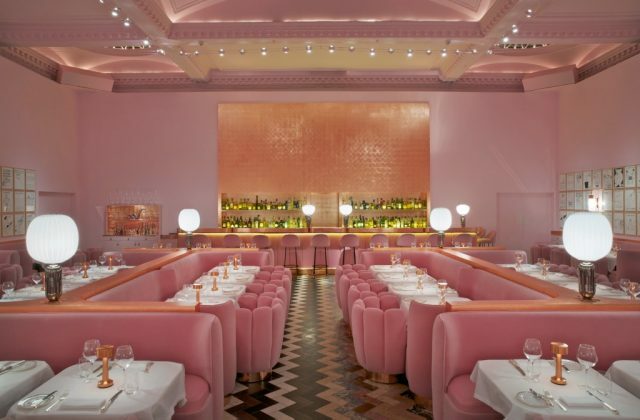 This bubblegum pink pleasure dome in Mayfair is straight out of a Wes Anderson film and is the stuff of little girls’ dreams, its domed ceiling, copper touches and Art Deco lights adding to its timeless feel. Its pink velvet fanned chairs look like lady finger biscuits, which is apt as the Gallery is the perfect place to enjoy a leisurely afternoon tea. The Gallery is also home to outré artworks by David Shrigley, whose black-and-white works will be replaced with a colourful new collection this year that play on everyday situations and human interactions. How wonderful to see such opulent places to dine – my visit to Zedel’s when I was in London three years ago was memorable for the food, service, and of course the wine, as well as the OTT decor. A memorable experience. Thanks for these photographs. Hi, Dickie Fitz is closed! Check out No 11 in Pimlico instead. Thanks for sharing the information about most beautiful restaurants in london.